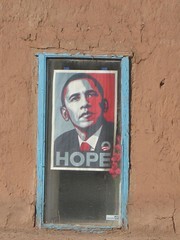 hope change hope, A Fourth Street resident in Albuquerque expresses wishes for the ’08 presidential elections, photo © 2008 by ybonesy. All rights reserved. My daughters are in on it now. This weekend, driving down Fourth Street in Albuquerque’s north valley, Em points one out. “Was it worth stopping for?” I ask her. I pull over, wait for the cars behind me to pass, then do a U-ey. She’s right, this one is gorgeous. 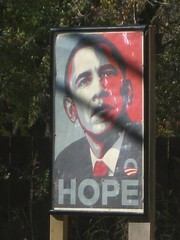 Here’s what we’re noticing as we drive around town. 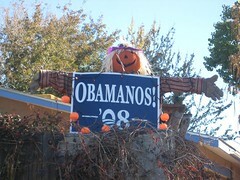 People in the central Rio Grande Valley are expressing their support for Barack Obama in very creative ways. Signs are cropping up everywhere—and not just your ordinary signs. 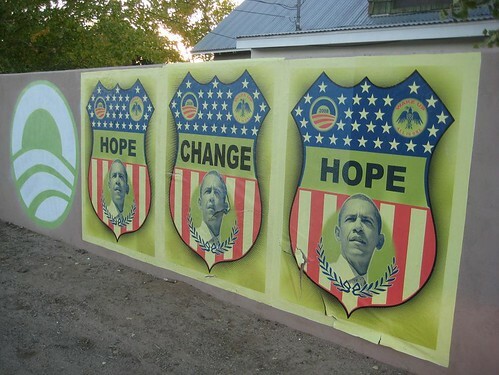 We’re seeing oodles of the large Hope sign that features the bold graphic of Obama’s face. And we’re seeing handmade forms of political expression into which people are putting time, energy, beauty, and humor. All along the main roads in Albuquerque’s north valley, as well as Corrales, you can see ’em. Yes, there are plenty of your standard political signs for both sides, but the ones we’re stopping to admire and photograph are standout. Personally, I’m knocking on doors in historically “red” precincts, and even though it’s not my favorite type of work (last election, homeowners nearly chased me off their lawns by election day) I’m still putting myself out there. And I can tell you this. 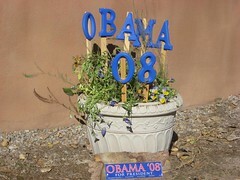 Deep in my gut, I know that NM will, indeed, be “blue” this election. I feel it in my bones. The signs. No one ever got this into it in 2004. No one seemed to do anything more than slap a machine-made yard sign in front of a wall. The signs we’re seeing this round tell me something about the level of passion people have—they’re going out of their way to express themselves. At an early vote rally on the day after early voting began, about 100 Obama supporters and I stood with signs on one of the busiest street corners in one of the most conservative precincts around, and we got a surprisingly large number of thumbs-up, high-fives, and cheers from passing cars. Yes, we heard and saw a few obscenities, but the positives far outweighed the negatives. I’ve gone from being a nervous Nellie to having hope. I worked the 2004 elections and I can tell, something is different this time ’round. I’m proud to wear my Obama buttons and drive around with my “Obamanos” bumper sticker on my car. Last election, people flipped me off when they saw my Kerry bumper sticker. I got to where I cowered over my political expression. All that fear is gone today. Finally, my kids tell me that most of their friends are voting for Obama. Of course, my kids’ friends can’t vote, but their parents can. I have a feeling these young’ins are echoing their parents’ preferences. So there you have it. I see hope on the ground, and I feel hope in my heart. Now let’s go make it happen. 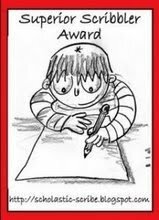 -Related to post WRITING TOPIC – WHY I VOTE.